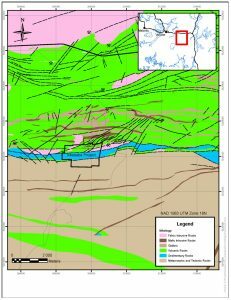 QUEBEC – The federal Department of Environment and Climate Change has concluded there will be no significant adverse environmental effects from the Akasaba West copper-gold mine 15 km east of Val d’Or. The project includes developing, operating and decommissioning an open pit mine as proposed by Agnico Eagle Mines of Toronto. The approval comes with more than 100 conditions to protect the environment including mitigation measures and follow-up requirements that Agnico must fulfill. Of particular interest is the local caribou herd. Agnico must reduce habitat disturbance, manage noise and light to minimize disturbance, and conserve and restore four times as much habitat as will be disturbed by the mine. The federal and provincial governments have agreed to work together on additional measures to protect the Val d’Or herd. There are only 18 animals remaining in the herd. The Akasaba West property was the subject of sporadic exploration from 1944 to 2001. There is very little information about Akasaba West on Agnico’s website, but there are many more reasons to visit www.AgnicoEagle.com.